Ruby flinched back as a drooling, grinning woman in a lab coat lunged at her. Ruby spun and kicked the woman in the stomach. The woman fell backwards. Two others pushed past her, their arms out to catch Ruby. Ruby backed against the wall. She caught sight of Basha just as a woman buried her mouth in the back of his neck. He screamed. Dr. Yocum watched, grinning with delight. Ducking under the arms of an advancing Simp, she pushed towards Dr. Yocum, clearing all the attacking Simps. Dr. Yocum seemed surprised, both by Ruby's speed and the strength she applied as she dragged him backwards towards the stairwell. She slammed the door behind her and threw him against the stairs. Yocum lay against the steps, holding the back of his head where it had hit a metal corner. "What I had to." "You let them out of their cage?" "Your friends were going to ruin everything. They were going to return those poor people—everyone—back to their sub-optimal existence." Ruby shook her head. "What are you talking about?" She pointed at the door. "That's not living. That's a bunch of mindless—" Ruby's eyes widened. "What did you do to Skylar?" She advanced on Yocum. Just then, the doorknob turned. She grabbed it and held it still. "Your android is fine. I trapped it in the safe." Ruby struggled with the doorknob. Whoever was on the other side, they were very strong. "Don't worry," Yocum said as he dusted himself off. "With the work your friends have done, I can come up with a new formula—one that will balance individual autonomy with the joy the Aeterna Storm provides. It will only be a matter of a few weeks, I'm sure." "You're crazy. If you think I'll let you..."
The doorknob slipped from Ruby's fingers. The door flew open. On the other side, Basha stood, his eyes glazed, his mouth hanging in a slack grin. Ruby barely jumped clear as he leapt at her. She used his forward momentum against him and pushed him into Yocum. She had to retreat. There was no choice. "I'm sorry, young lady," Dr. Yocum said. "You may not appreciate what I've done, but—"
Ruby punched the man hard in the nose and felt a crunch under her knuckles. He went down, blood streaming from his face. The Simps crowded through the door. Ruby ran up the steps. A crowd of Simps chased after her. She'd run outside. She'd call Bryce. As she ran towards the Gen-Corp lobby, she slapped at her pocket. Empty. Her phone was down in the lab where she'd left it. Outside the glass entry of GenCorp, a row of Simps stood staring in, smiling, the artificial lights casting eerie shadows down their faces. 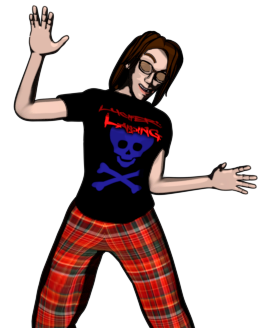 It was night outside, and in the shadows, she spotted more grinning zombies approaching. Ruby stood, horrified. She couldn't get out. She'd have to find another exit, but how many of them were out there? A hand fell on her shoulder. She grabbed it and spun, twisting the arm of the attacker backwards. The Simp doubled forwards, a woman in an army uniform. She turned and grinned, the left side of her face torn with dried blood along a deep gash. Ruby shoved her and ran. She raced into GenCorp, the way she'd come the day before. She climbed the stairs and searched for a place to hide. As she approached the broken vending machine, she rounded a corner and ran into the back of a man in a filthy business suit. He stumbled forward half a step, stood still a moment, then turned to face Ruby, his mouth smeared with chocolate. "It's a beautiful evening," he said. Ruby kicked him in the crotch and turned to run. He caught her by the hair and nearly yanked her off her feet. She pulled away, ripping hair from her scalp, and raced down the hall to the room with the projector she had found the day before. Ruby slammed the door shut and tipped a cabinet to block the door. The door opened a centimeter and hit the barricade. Ruby piled more furniture in front of the door. She lifted a credenza on top of the cabinet, then knocked a lab table over and piled it on top. She ran to the overhead projector at the center of the room. It was still on, still aimed at a black screen that couldn't possibly be of any use to anyone. She was about to lift it and throw it on top of the pile, but she stopped when she read the transparent slide that lay on top of the projector. Ruby's mind went blank for a moment. She read the slide several times, then stared at the black screen that received the projection. 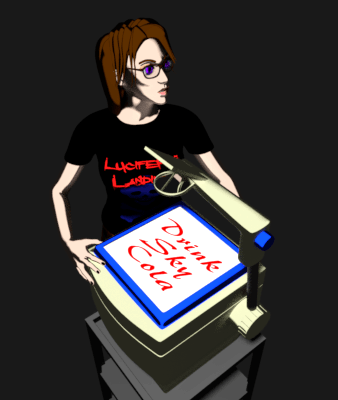 Drink Sky Cola . She repeated this in her mind. What was this place? The sign outside read GenCorp Marketing Division. An idea formed as she stared at the slide. She spun around and found a black marker on one of the lab tables. Bryce lay in the convertible, dozing. The radio, which had been playing a soothing new age drone of synth music and harps, switched to something that might have been mariachi music with kettle drums. Bryce shot up to adjust the dial. It had taken him ten minutes to find something he could sleep to. He grumbled as he cranked the dial once again. His eyes flitted up to the sky. The moon hung low, a few days past full. He glimpsed the message across its surface before continuing on the radio dial. Ruby threw a chair through the plate glass window. It shattered, and the cold night air blasted her. She used a stapler to knock jagged shards of glass away from the edges. Something slammed into the door. A hand reached through the crack, feeling around the edges. Another slam against the door, and the chairs on top of the furniture pile fell away. "Please, Bryce," Ruby muttered, leaning out the window and searching the sky. "Please see my message." She knew her idea had worked. Out the window, she could see her message on the moon above the Eastern horizon. That was her handwriting. Anyone on this side of the earth could look up and see what she had written. She hoped it was enough to direct Bryce to her position. She hoped he'd make it in time. Another slam. The head of the man in the business suit squeezed through the gap. He searched the room, then spotted her. He grinned. "Hello," he said. "Isn't it a beautiful evening?" His head withdrew. He slammed against the door again. The pile of furniture toppled away. He stepped through. Ruby searched outside the window. There was no ledge. She could jump to the ground, but shadowy figures moved below her. She'd find no safety there. The man in the business suit stepped over the fallen furniture. "Why aren't you smiling?" he asked. Ruby smiled. "It is a beautiful evening," she said. The man cocked his head. "Yyyeessss." He agreed. "Um, and the wind outside—very bracing." The man stared, his smile bright but his eyes confused. "And I couldn't be more filled with glee." He stepped forward. "What is your generation?" He stopped again and cocked his head. "Searching for signal." "Thirty-six point five. Searching for signal." "Thirty-six point five is inferior," Ruby said. "Why aren't you smiling?" Ruby asked. His face strained. His jowls quivered. The hum of Bryce's engine approached from outside. Ruby peaked out spotted him, the convertible top retreating as he neared. The man in the business suit approached again. "No signal detected," he said. Ruby climbed to the edge of the window. 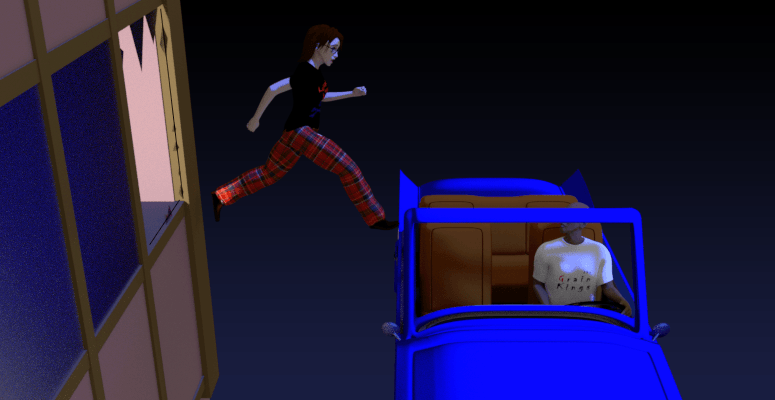 When Bryce neared, she leaped out, over the door into the back seat. Bryce sped away into the sky. For a moment, neither of them spoke. "You wrote a message on the moon." "Our names are on the moon." "Is it going to change back?" "Not until we change it." "Where's Chandra and Basha," Bryce asked. "They're infected," she said, climbing into the front seat. "Everyone's infected." "Maybe. But we might have a chance."